here's a beauty blog backtrack i wrote last winter. considering the same rules still apply, i thought i would share again. the same foundation that works for you in the summer probably doesn't work for you in the winter. i know it can be expensive to make sure you have a foundation for every season but if you pick them up on clearance (often found at drugstores) it shouldn't be too hard on your wallet. 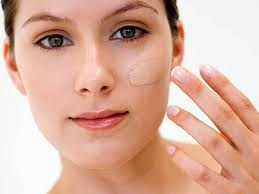 easy foundation application can be as simple as using your fingertips, the best makeup tool you have. if you want to go for an even smoother finish, try using a sponge or foam wedge. this will eliminate any harsh lines and the corners of the sponge are great for getting around the nose and on the inside corner of your eyes. applying foundation to your eyelids can instantly brighten your look if you prefer a natural finish to your eyes. the most obvious mistake with foundation is that line you get on your jaw and chin. to avoid this, apply your makeup from the center of your face outwards. using a primer acts as "Velcro" for your foundation. primer gives you lasting strength and smoother coverage. if you want your makeup to look professional, don't skip the professional step. hope that helps you get your face on. I have never used a primer. Does it really work?What kind do you suggest? I would highly recommend using a foundation brush. The oils in your fingertips break down the chemical composition of your foundation, dramatically reducing it's wear time. If you use a sponge it needs to be replaced weekly, because it will harbor bacteria that can lead to breakouts. Sponges also absorb (and waste) foundation. I have found the best solution is a foundation brush which will not waste your foundation and can be washed on a regular basis. The best foundation brush I have found is sold by Chanel, it is pricey but well worth the investment. Estee Lauder also sells a decent brush. Also a well matched foundation can be applied to the jaw line and will not leave a visible line. i would definitely recommend primer. i use MAC's Prep + Prime which works great but i know there are many varieties and price points you can purchase at. primer helps your foundation last for HOURS, so if you have a special event, it is a must. I love my Laura Mercier primer. It makes my foundation last all day and not get flaky.